Mladá Boleslav, 6 April 2018 – The carsharing portal HoppyGo has merged with the mobility services provider SmileCar from Czech transportation company Leo Express, thus allowing private car carsharing to be combined with bus and rail transport. From now on, customers are able to book and pay for everything offered by the one-stop mobility services provider using a single smartphone app. As HoppyGo remains a brand of the ŠKODA AUTO DigiLab, ŠKODA AUTO has also remains one of the providers of peer-to-peer carsharing in the Czech Republic. ŠKODA AUTO is thereby taking the next step in its transformation from purely a car manufacturer to a provider of integral mobility services. “ŠKODA considers mobility to be an integral concept involving vehicles and services. 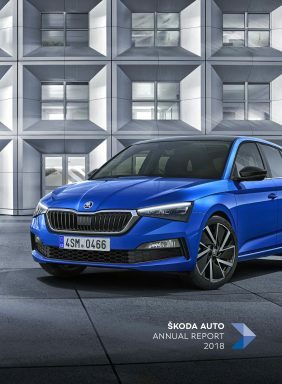 The ŠKODA AUTO DigiLab is rigorously progressing this concept – developing all sorts of new business models,” explained Andre Wehner, Chief Digital Officer at the long-established Czech company. “The ŠKODA AUTO DigiLab’s new joint venture is putting two important aspects into practice: the shared economy and multimodal mobility by interlinking several modes of transport,” said Wehner at the joint venture presentation in Prague. “Our joint project offers solutions to all today’s transport challenges, whether with its sustainability, infrastructure constraints in cities and on roads, or problems with transport accessibility. Our goal is to make HoppyGo carsharing available throughout the Central European region and especially in locations where Leo Express trains and buses have their stops,” says Peter Köhler, CEO of Leo Express. ŠKODA AUTO introduced the new joint venture today at the ‘Smart Mobility Hackathon’ in Prague. In this competition, which the ŠKODA AUTO DigiLab is supporting as a partner and co-organiser, the participating teams developed creative ideas and projects relating to the individual mobility of the future. The ŠKODA AUTO DigiLab first established the carsharing provider HoppyGo in Prague and has since built it into one of the largest private carsharing portals in the Czech Republic. Car owners wishing to privately rent out their vehicle and people interested in renting them can find one another quickly and easily via the smartphone app. In addition to various ŠKODA models, the carpool also includes vehicles from other brands. The integration of rail and bus transport as well as of the carsharing portal ‘SmileCar’ take the offering to a new level: from now on, HoppyGo users can also have the app suggest multimodal travel arrangements – meaning several modes of transport can be combined. After long bus or train journeys, a private car can be rented at the destination with ease. Therefore, an increasing number of HoppyGo users make their cars available near bus or train stations. Thanks to the joint venture, more than 750 cars are now available – and this number continues to increase. Carsharing is targeted in particular at younger users, for whom it is less and less important to have their own car. Carsharing is equally attractive for people who don’t want to give up having their own car and at the same time are open to new mobility concepts. Digitalisation and connectivity are two cornerstones of ŠKODA’s 2025 Strategy. With this programme for the future, ŠKODA AUTO is preparing itself for future changes in society and the automotive industry. Here, the ŠKODA AUTO DigiLab serves as a central development workshop for new digital solutions, services and technologies. Just like the ŠKODA AUTO DigiLab itself, HoppyGo is an innovative start-up. ŠKODA’s think tank is recognised as part of the start-up scene and is constantly looking for opportunities to collaborate with other creative entrepreneurs from the IT industry.